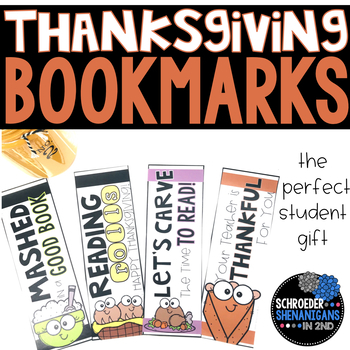 These THANKSGIVING BOOKMARKS make great Thanksgiving gifts for your students and they help you to promote a love for reading all throughout the fun fall seasons! These bookmarks are a part of my BOOKMARK BUNDLE that you can snag at a discount to have student gifts ready for all year long! You can choose from printing the colorful version or you can choose an ink friendly version and print the black and white version on colorful paper! I always like to personalize them by hand writing an encouraging note to my kiddos on the back as well!